Temazcal is a traditional steam bath that has been used for both healing and ritual purposes in Mexico for hundreds if not thousands of years. The name “Temazcal” comes from the Nahuatl language and means “bath house.” Temazcal is an incredibly spiritual experience led by an expert called a Shaman and is intended to purify the body and soul, release stress and promote relaxation. It also provides health benefits that are beneficial for treating muscular pains, respiratory problems and other chronic diseases. The ceremony lasts for 1-2 hours inside a small dome-shaped lodge. During this time an herbal tea made by soaking fresh herbs is splashed over heated volcanic rocks to produce a powerful fragrant steam. The mystic objective of Temazcal is to be “reborn” as a person to release any toxins from your mind, body and soul. We are proud to offer this ancient treatment at Now Spa by Pevonia. If you are interested in participating in a Temazcal ceremony during your next stay at Now Sapphire Riviera Cancun, please email our Spa Manager at spa.nosrc@nowresrots.com for more information. 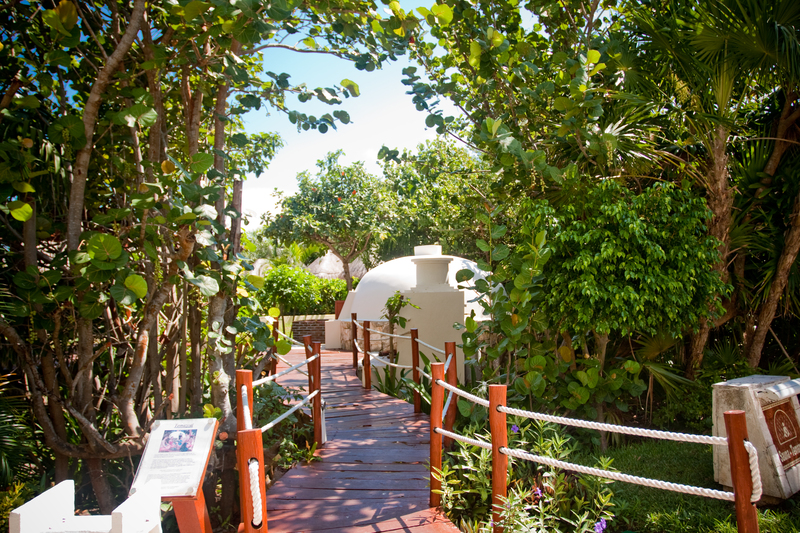 This entry was posted in Now Sapphire Riviera Cancun and tagged ancient ceremony, ancient ritual, Mexico, Nahuatl language, Now Spa by Pevonia, purify body and soul, release stress, Spa treatments, spritual ceremony, Temazcal Ceremony. Bookmark the permalink. The Temazcal at NOW Sapphire is a MUST DO!